Common Mistakes with Carbonyls: Carboxylic Acids… Are Acids! I know that seems obvious. But it’s a near certainty that students taking Org 2 for the first time will forget this occasionally. Here are two common mistakes that I see *all the time*. 1) Reactions of Grignard reagents with carboxylic acids. Grignard reagents (with the general structure RMgBr) are great nucleophiles. They add to ketones, aldehydes, esters (twice), acid halides (twice), epoxides, and a number of other carbonyl-containing compounds. For students getting their feet wet with carbonyl chemistry, it can be tempting to also draw Grignard reagents adding to carboxylic acids. That’s because carboxylic acids are… acids, and Grignard reagents are very strong bases. So instead of adding to the carbonyl carbon, the Grignard is simply protonated first. And the resulting conjugate base of the carboxylic acid (a carboxylate) is too unreactive to react further. Carboxylic acid derivatives like esters, anhydrides, and acid halides react well with good nucleophiles like HO- and RO- . The pattern becomes familiar quite quickly: 1,2 addition, followed by 1,2 elimination. Seeing this pattern, students get lulled into a false sense of security that carboxylic acids will react this way as well. They don’t – for the same reasons that Grignard reagents don’t. Carboxylic acids are acids. They protonate strong bases (such as alkoxides) and leave behind the carboxylate, which – again – is unreactive. 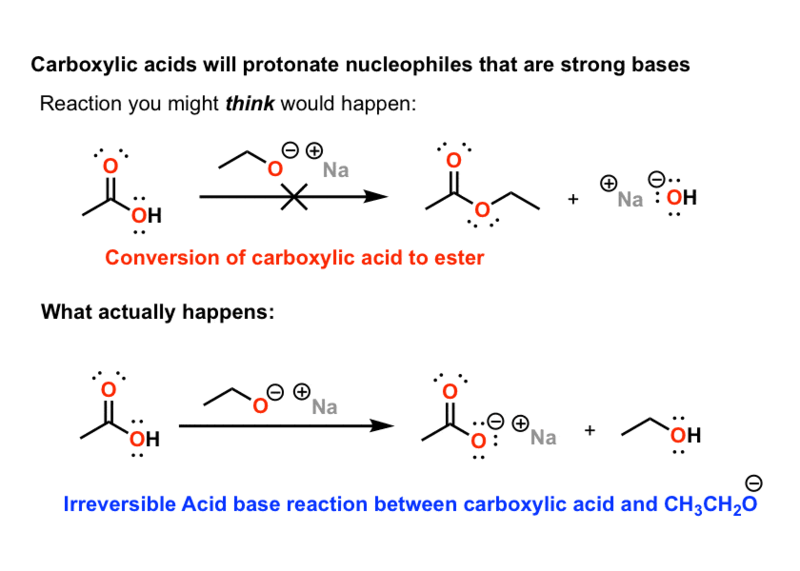 Note below: It’s a pretty good rule of thumb to assume that acid-base reactions will happen faster than reactions that involve nucleophilic attack, such as addition to carbonyls. If you’re keen, there’s a name for this: the principle of least motion. That’s why we see protonation of the Grignard reagent before it has time to add to the carbonyl carbon. I was also confused this matters. So is there a way to add alkyl groups to carboxylic acids? Lets say I wanted to go from a carboxylic acid to a tertiary substituted alcohol. If you use organolithium reagents you can add alkyl groups to carboxylic acids to form ketones. These will also deprotonate the carboxylic acid to the carboxylate, but are powerful enough to add to subsequently form the C-C bond. However I believe that the intermediate that is formed is fairly stable and will not eliminate to give the ketone until workup. To get the tertiary alcohol you’d have to submit the ketone to another equivalent of organolithium (or Grignard if you prefer). Hope this answers your question. how most grinard react with carb. acid? As shown here, they are usually protonated! Carboxylic acids + amines is another common proton transfer example that students miss. I don’t know how many RC(=NR)OH products I’ve seen – it’s a lot. thanks that’s a lot of help so how could you prepare an ester from a carboxylic acid without carrying out fischer esterification? Ahh..that embarrassing feeling when you realize that you forgot what you know oh so well just a few days ago. Great post, I had understood it when I saw it last semester but recently I came across that Organolithium reaction you had mentioned in the comments. I’m a little confused as to why if you add the 2 equivalents of Organolithium you can use the first to deprotonate and the 2nd to add on but you can’t do the same thing with 2 equivalents of Grignard reagents. Is it simply that the Grignard is weaker? I had always thought the two were extremely powerful nucleophiles/bases and didn’t differ too much. This may be an oversimplification though, and I welcome anyone who knows of experimental data or computational studies that explain this. The mechanism itself could be entirely different, as these reagents do sometimes do funky things such as single electron transfer (SET) radical mechanisms. But back to the Li Lewis acidity. You can compare it to the difference between LiAlH4 and NaAlH4 or NaBH4 and LiBH4. In both cases, the Li salts are more reactive. A lot of the difference is likely due to the Lewis acidity, but there could also be solvation differences that affect reactivity as well. In fact, solvation/Lewis acidity pretty much accounts for the difference in reactivity between LAH and NaBH4. Thermochemical studies of the bare ions AlH4- and BH4- show that there is no difference in the hydride binding energies, and the activation energies for reduction of CO2 in the absence of solvent and counter-ion are the same for AlH4- and BH4-. It’s not always easy to think about the structures of things like organometallics or inorganic salts in organic solution. Even subtle differences in structure like diethyl ether and THF can change solvation properties, and these things can have large effects on reactivity. Fortunately, we have folks like Hans Reich and Dave Collum to help us understand it better. what other functional groups can cause a similar problem ? Hydroxyl groups (OH), thiols (SH), and generally any other mildly acidic functional groups. Carboxylic acids are by far the most common situation one encounters. 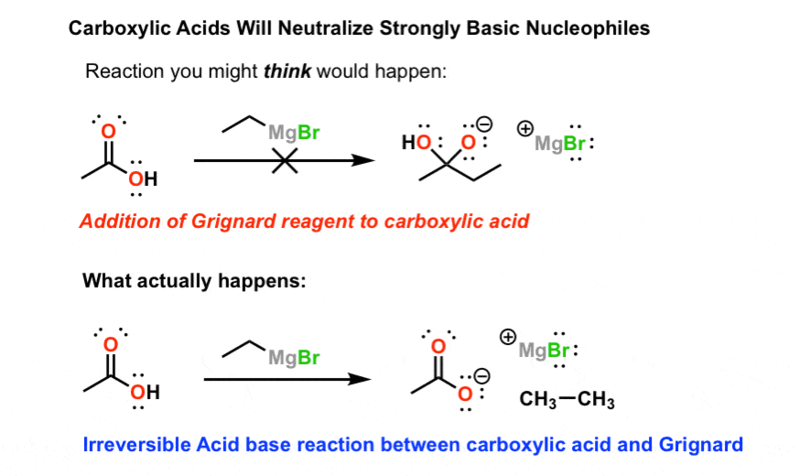 Could you explain why HBr doesn’t add to a carbonyl in a nucleophilic addition?? The C-Br bond is much weaker than the C-O pi bond. Even if a C-Br bond did form, it would quickly be expelled to regenerate the carbonyl.